The natural climate of Agn/Eğin (present-day Kemaliye) is temperate. The town, built near the banks of the Euphrates atop a huge cliff face, resembles a fortress with its gardens and houses surrounded with greenery. Off in the distance, on the mountains, are the neighboring villages. At the center of Agn, the Kadı gölü spring flows from a massive cave. This is how the town of Agn got its name. (Agn, in Armenian means spring/source) Since the town was built in the shape of an amphitheater, the spring’s waters are distributed to all parts of the town via its rivulets and streams. The neighboring villages are also rich in fast-flowing springs. But there was little land to cultivate between the town and its villages. The area was too mountainous and craggy. 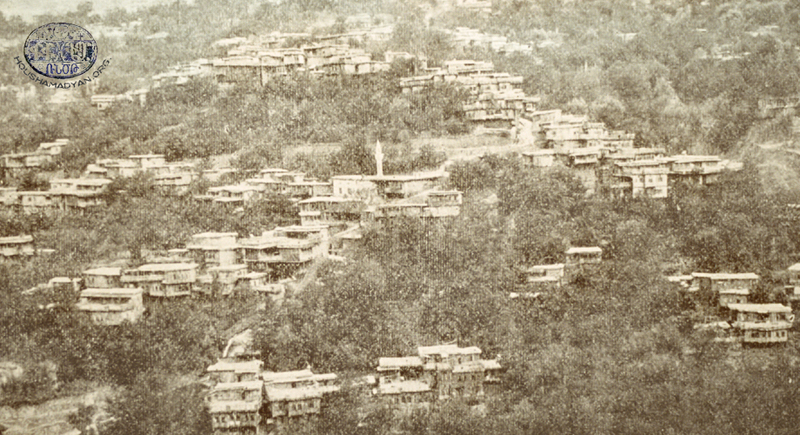 For centuries, local residents devised a form of terrace farming along the mountain slopes. They’d remove the rocks and gravel and bring in soil from other areas. The entire mountain slope, from the town to the Euphrates, was covered with these gardens. Farming would commence after the great thaw, on the holiday called Karasoun Mangants (Forty Children). Residents believed that the holiday would auger a harvest of both quality and quantity. Workers would be hired to work in the gardens and vineyards. (In the Agn dialect, the word ayki meant both grape vineyards and gardens) They’d remove the debris left by the thaw, prune the vines, and till the garden beds before planting. a) The lor mulberry is juicy and is used to make shira (must). The juice is used to make mulberry merugh (roub – syrup).b) Two seedless varieties – khagig and sheker – are valuable for drying and exporting. They are also canned for winter use. c) The kltig is large like a strawberry. d) A sweet drink (sherbet) is made from the sour khar mulberry. 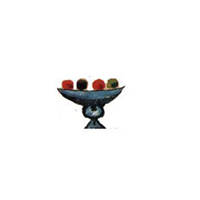 When unripe and red, it turns to a dust when dried and is used as a sour herb in meals. Sweets are also cooked in the mulberry and grape juice. The juices are also distilled to make oghi (grappa/brandy). There is another variety, khoja yemish, with small black and yellow seeds, which ripens with the autumn cold and can only be eaten after the first snowfall. This fruit is the size of a hazelnut and the mouth puckers when eating it. Almond and walnut trees abound on the mountains. The plentiful harvest was sent to Istanbul. Neighboring Turkish and Kurdish villagers oftentimes targeted the white and oily walnuts with large nuts for looting come harvest time. Various plants, used in cooking are plentiful on the mountain slopes - peppermint, curcuma, burr chervil, rhubarb, dill, artichoke, etc. Residents planted whatever was possible and what was needed for daily household use on small plots and in between trees. Many different types of vegetables – tomatoes, peppers, cucumbers, eggplants, beans, turnips, cabbages, squash, onions, etc. – were grown this way. Due to the lack of meadows and fields, wheat and other grains, and all other items for winter canning, as well as diary and meat, were either purchased or obtained by barter from neighboring Kurds. Eggplant, peppers and okra came from Arapgir’s Shikar valley. Potatoes, onions, turnips, carrots, beets, squash, etc. came from the villages of the Upper Mountain. Kurdish women picked plants, mushrooms, sorrel, louidj (type of beet leaf), etc. Wheat was brought from Sivas/Sepasdia. The common bread of Agn is called loshig – with large, wide, thin and flat layers. After kneading the dough, the women bake the bread in ovens, and then dry it for keeping in the cellar. For eating, the bread is wetted. Various breads are also baked for special occasions. Badjoug is a dry pastry made of fat and flour baked in the size of a nshkhar (small consecrated round bread). It is stamped with flower-like designs and is sent as an invitation to a wedding. Lolig, is a small bread. Klrdig is bread made of semolina (fine cracked wheat, irmik) for children. There’s djoudjoug, another bread for kids made of fat and made into different shapes. Glodj is unleavened bread made of vegetable oil for Lent. After boiling and drying, the wheat is taken to the mill where it is made into coarse bulghur for pilav; medium for balls (gololag); and fine (srmouk) for soups. There is also a flour-like bulghur mixed with bran called dznig (semolina, irmik). A dish called tarkhana was made in the summer with the bulghur. Once dried, it can be preserved in the cellar. Agn was known for three types of tarkhana. A dish called khavourma (kavurma) was made from meat. Small pieces of meat are first boiled and then fried in fat. It is preserved in the same fat. Agn residents had a special kind of spiced meat called geode, made without çemen (fenugreek). Cucumbers, grape leaves and various vegetables were pickled in earthen pots. Cheese was also kept in these vessels. A dairy product called chokalig, curds made from milk or than (yogurt + water), was also prepared. Whisking the madzoun (yogurt), the fat rises to the surface. The fat would be skimmed off and made into balls as butter. There was another type of cheese called ouli banir (young goat cheese), which was without salt. Chortan was made by squeezing the tahn or madzoun into balls and then drying them under the intense summer sun. Roub (shirig – syrup) was made from the juice squeezed from mulberries and grapes. Various fruits would be cooked in the syrup to make rechel (sweets). They also made plit - starch cooked in grape syrup that was cut and dried. Two other sweets were basdegh and sharots. Wine was prepared for the winter. A distilled spirit – kamchour - was also made and jokingly called ‘white water’. This dish was made by cleaning the shanks and feet of cows. They would be cooked overnight in large pots of water. The scum is constantly removed. A large table is prepared in the morning. The dish, both broth and pieces of meat, are served on abundant bread. Crushed garlic and red pepper are added. Agn residents had a tradition where a young goat or lamb was butchered on the day before the holiday of Asdvadzadzin (Holy Mother of God). The animal would be hung in a tonir (underground clay oven). Underneath would be placed a large vessel full of coarse bulghur and water. The mouth of the oven would be closed with a special lid and the edges covered with mud. After a few hours the mud would begin to crack meaning that the dish was ready. Separate bread into layers, dip into beaten eggs, and fry in hot fat. Serve with honey dribbled on top. Brush water on bread. Then dip in walnuts and heat in oven. Dribble honey on top and serve. Pulverize all the herbs. Mix in red pepper, sesame seeds and salt. Can in jars with lids. Before eating, pour some oil on the mixture, spread on bread and enjoy. This savory dish is prepared during Easter with a sweet tarkhana made from grape syrup. Boil the bulghur with the chopped fruit and walnuts. Add the syrup. Boil a few more minutes and let cool. Eaten by crumbling bread into boiled milk. There are many savory and semi-liquid porridges, often served with oil and syrup, eaten daily in Agn. Cook the milk and rice on a low flame until the liquid is absorbed and the rice melts. Add the sugar and cook a bit more. Serve with cinnamon powder. Dissolve flour in water and boil while stirring constantly. Add the fat and let boil for several minutes more. Serve hot and dribble with syrup. Dissolve syrup in boiling water. Work the flour with cold water and pour syrup on top. Continue to cook for a few minutes. First roast the flour in fat and set aside. Boil the bulghur in plenty of water. Then mix the flour and boiled bulghur. Roast the flour on low flame. Stir constantly until the color turns golden. Slowly add boiling water, stirring constantly. Add the salt and remove from flame. Cover the lid and let rest several minutes. Make a small circular indentation and pour oil and syrup. Cook semolina in water. Stir constantly until mixture comes to a boil. Remove from heat and add the fat. Toast the bulghur in fat. Add water and spices. Then add flour refined in water and cook until it reaches gruel like consistency. Cook corn in boiling water until gruel like. Serve with fat on top. Holiday dishes include harissa, dolma, kaladjosh, hardala, kntig, etc. Boil the rooster (or chicken). Remove meat from bones. Then first add soaked dzedzadz and cook over low flame. When the grains have expanded mash with wooden spoon until consistent. Beat the yogurt, flour and egg together; then boil. Chop the onions and blanch in fat. Add this to yogurt mixture. Then add walnuts and mint. Mix and let mixture cook a few minutes more. Serve with dried bread or lavash. Prepare meat into cubes and boil with pre-soaked chickpeas. Add rest of ingredients and cook. Mix and knead the meat and bulghur with wet fingers. Prepare the mixture into walnut-sized balls which are then boiled in a soup made of tahn (yogurt + water). Dolma with meat is prepared for holidays. Otherwise fat is substituted for meat. For Lent, oil and walnuts are used. The mixture is wrapped in grape leaves pre-soaked in salt. Other vegetables are stuffed in summer. In winter, the dried innards of eggplant, squash and peppers are used. Add the bulghur to meat, diluted tomato paste, chopped onions and greens. Knead and add spices. Wrap in leaves of stuff in vegetables. Fish are brought from neighboring lakes and rivers. It’s either grilled or dipped in egg and fried in vegetable oil/fat. There are also a number of very watery soups in which dried bread is crumbled and eaten. Boil dzedzadz. Add fat, chopped tomatoes, shredded cheese and spices. Beat eggs and add atop soup. Before removing from flame, add chopped greens. Add shredded cheese and fat to boiling water. When cheese melts and water turns white add beaten eggs. Before removing from flame, add chopped scallions. A non-fat soup – just boiled dzedzadz. It’s sometimes called khashou. Slice onions and sauté. Adds lots of water, add spices. Add beaten eggs atop and serve with old bread. Whisk yogurt with water. Add egg and flour. Boil. Chop onions and fry in fat. Add mint. To serve, pour hot tahn on lavash bread followed by onions. This soup is prepared on Maundy Thursday. No fat is used. It contains vinegar, in memory of the fact that Christ, while crucified on the cross, was given vinegar instead of water to drink. Boil the greens, add the bulghur, spices, and serve with vinegar. Mix the yogurt, add the egg and flour, and then boil. Slice and boil the squash and turnips, then add over yogurt. Chop onions and fry in fat. Add to the soup. Add spices and boil for five minutes. Finely slice onion and fry in fat. Add the bulghur and spices, then water and cook on low flame until liquid has been absorbed. Cut onion into layers and fry with meat. Add bulghur, then water and spice. Cook on low flame until liquid has been absorbed. Sauté vermicelli. Add rice and brown a bit. Then add water and cook over low flame until liquid is absorbed. Slice and boil squash and let cool. Then add yogurt, salt and mint. Dilute yogurt with water. Add sliced cucumbers, greens, garlic and nuts. Serve with dry bread. Heat fat and add flour beaten with eggs. First cook on one side, then the other. Serve with honey/syrup dribbled on top. Heat fat. Crack eggs and cook so that yolks remain intact. This is prepared when a groom visits his father-in-law for the first time, or when a child is presented to the godfather when he comes to visit. It’s also served to esteem guests. Fry beaten eggs in fat. Cook both sides and serve with honey. Slice basdegh and fry in fat. Pour beaten eggs on top and serve partially cooked. Slice onion and sauté in fat. Season and add sliced spinach. Steam on low heat. Then add beaten eggs and mix. Slice and sauté squash. Add beaten eggs. Season and serve. Brown flour on low heat. Add fat and stir until they meld. Remove from heat and mix in sweets. Immediately pour into serving dish, flatten and slice. *People would also cook figs, quince, plums and apricots in that syrupy water. The custom of Agn was to also make sweets from a type of forest rose called govou vart (cow rose). Rose water and oil was made from the kharefil rose variety. Hovsep K. Djanigian, Հնութիւնք Ակնայ [Agn Relics], Tbilisi, M. D. Rotiniants Press, 1895, 500, 6pp., continuation: Շար Ակնայ Ժողովրդական Երգերի [List of Popular Agn Songs], recorded by Gomidas Vartabed, published by Mother See of Holy Echmiadzin, 1895, 16pp. Arakel Kechian and Mgrdich Barsamian, Ակն եւ Ակնցիք [Agn and its Residents] Paris, 1952, 814 pp. and “Appendix”: “Dictionary of the Agn Dialect, Old Manuscripts of Agn and Surroundings, Monks and Known Pilgrims, Amiras”, 231pp. 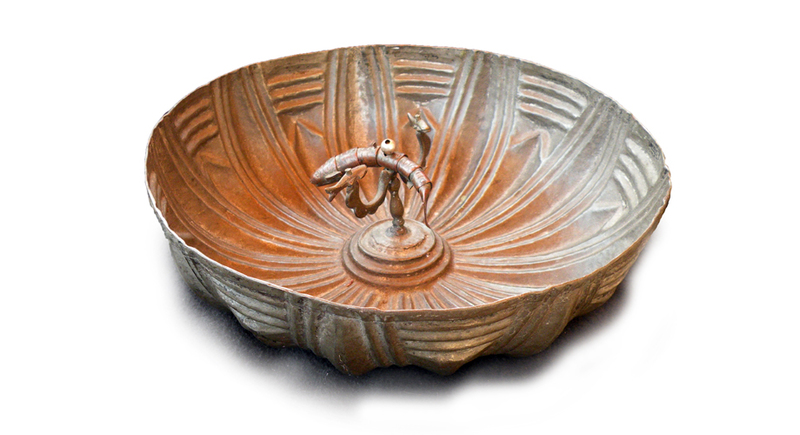 The above copper water bowl belongs to this family. In the family’s oral history, this bowl is noted as the handiwork of Melkon Nazarian. He was born in Agn in 1884 or 1885. A coppersmith, Nazarian later moved to Harput/Kharpert. 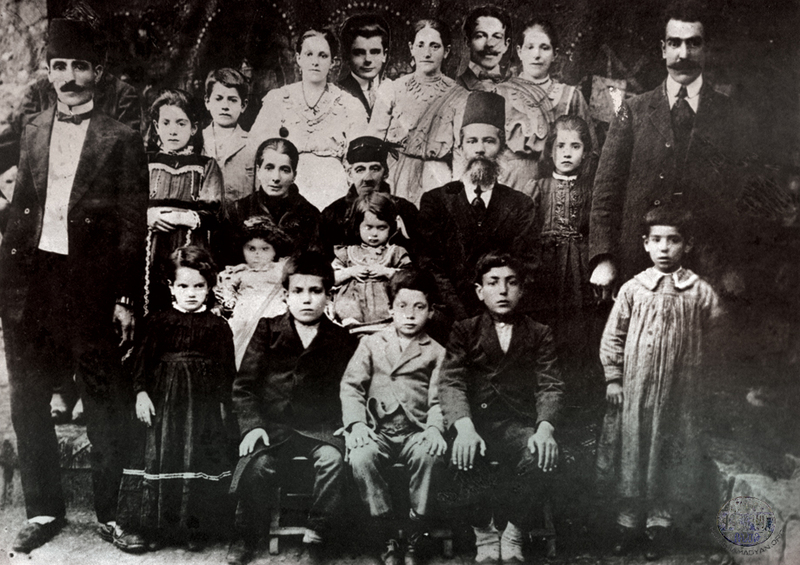 The Nazarian family continued to live in the Harput region after the Genocide. 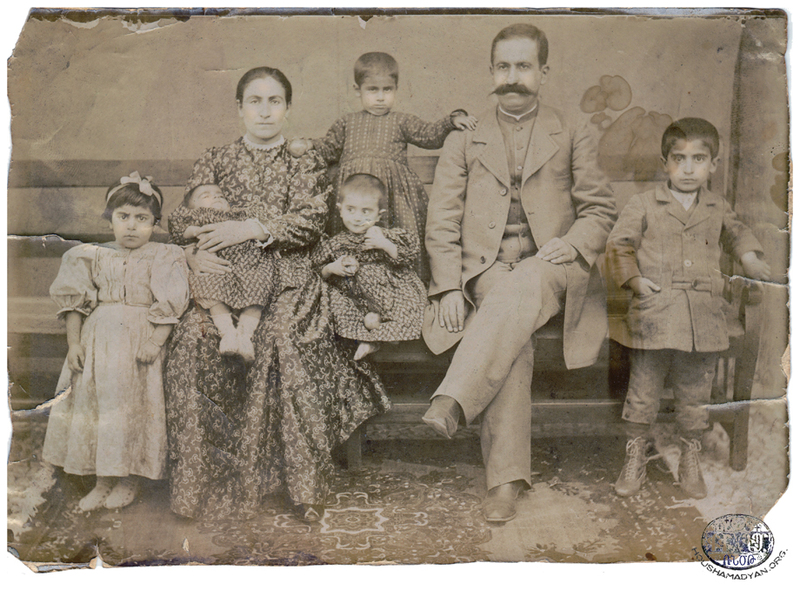 In 1931, Melkon succeeded to get his family out of Turkey, taking refuge in Aleppo. He was imprisoned for seven years but escaped, reaching the Syrian town of Djarablus along the border with Turkey. 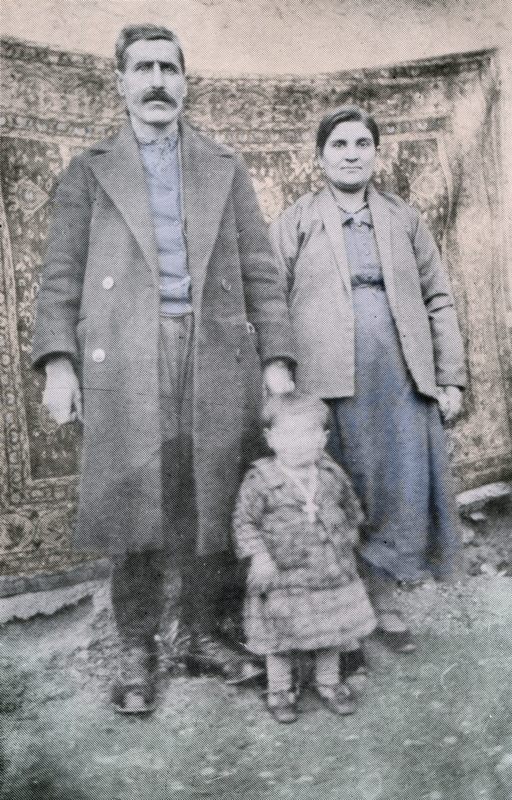 Melkon finally reunites with his family in Aleppo but dies a month later, on April 25, 1939, emaciated from years in prison. This bowl travelled with the family from Harput, and perhaps earlier from Agn, all the way to Aleppo. It was then kept in Aleppo by succeeding generations. It is now in the possession of Melkon’s granddaughter Sevan, who resides in Paris. It is imperative that you give us your name, surname and the source of you.